Yesterday was the hottest day in the history of Los Angeles by many measurements. So it seems like a good time to remind you of the song I wrote about how the sun wants to kill us. In fact, I recorded an alternate version of “The Sun is Going to Blow Up.” It’s got a bit of a school-teacher-storytime vibe where I explain how the sun will some day burst and consume all that we know and love. After all, it is a children’s song. 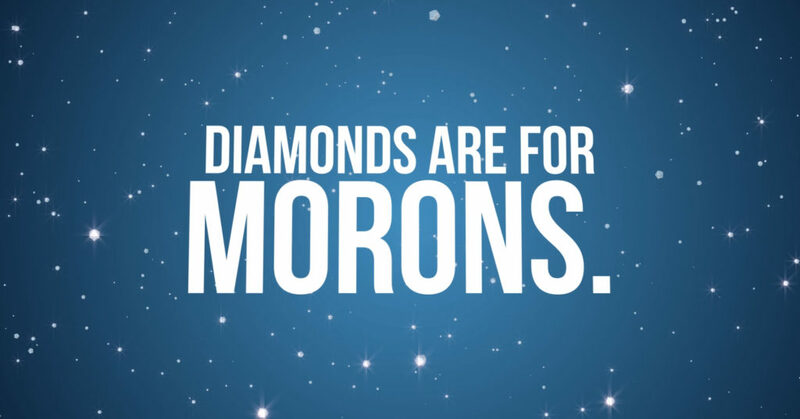 One day, I started wondering why diamonds are so expensive. And if they are so rare and expensive, how could they possibly have become such an integral part of our engagement rituals? Historically, very few people have been lucky enough to have disposable income, and yet, a whole lot of people have gotten engaged. How can so many people have observed an expensive ritual that requires an allegedly unobtainable resource? I did some research. I learned about a lot of lying. I wrote an essay. I set it to music and it was 26 minutes long, and I didn’t have nearly that much music. I wrote some more music. I linked the six themes and looped them to stick in your head. I cut the essay down considerably and practiced reading it really fast. I recorded it and worked with an animator to create a video. There’s a lot more that I wish I could’ve included. I wish I’d mentioned the fact that most of the world’s diamonds live in warehouses in Great Britain. Or that the biggest boom in the diamond tradition came from targeting traumatized World War II veterans who were looking for ideas to hang onto as they attempted to return to normalcy. Or how “recommitment rings” and “recommitment ceremonies” are just a shallow attempt to pawn off an excess of supply to a disinterested demographic. I wish I’d relayed more icky quotes in my old-timey barker voice. But I didn’t make time for everything. So, in 2,250ish words and 13ish minutes, here is all of the most important stuff that I learned. I hope it makes you laugh at a few things; I hope it makes you question everything. If this blows your mind too, PLEASE share and “funny” the video on Funny or Die. Or share the YouTube if you prefer. It’s also on Facebook for liking and sharing and commenting. And it’s way too long for Twitter. So don’t look there. If you want the MP3 of this song or any of my songs and albums, you’ll find them all for your downloading and streaming pleasure(s) at rhunekincaid.com/music. “Awkward with Evan” podcast (starring me)! Evan Wecksell is a fellow musical comedian with a great idea for a podcast. It’s called “Awkward with Evan,” and on it, he interviews all of the Facebook friends he’s picked up from years of gigging. Now that includes me! I babbled muchly about “Squirrelmageddon,” meeting your heroes without knowing they are your heroes, how Colorado is the best, and new and exciting ways to create music videos. Give it a listen! I remember writing “Write About Butts (Right About Butts)” very clearly. I was sitting on the floor of my closet. I was working on converting said closet into a recording booth, but it never worked out. I love those albums. I’d just met Billy Corgan at Loveline a few months prior, and then I got to see him perform a few nights later. I hadn’t seen Smashing Pumpkins play for 20 years and the whole band was different except for Billy. His frustration was palpable. He’d play a new song and get frustrated at the crowd’s indifference. Then he’d play a Pumpkins banger from 20 years ago, and the crowd would go nuts, making him even more frustrated. I’d finished writing this song about 20 minutes later, and I don’t think I ever changed a single lyric. I imagine people who are used to my usual singing voice probably wonder WTF happened to me on this recording, but that’s the only way I’ve ever sung this song: like a Smashing Pumpkins deep cut from the 90’s. Alex Montilla played the cajon. Mike Peralta held the camera. Thank you, gentlemen! Per usual, you can download this MP3 and the entire Squirrelmageddon album at rhunekincaid.com/music! Please vote ‘funny’ and not ‘die’ on FunnyOrDie and share that version wherever you can! Please share the video on Facebook. Please retweet the video on Twitter. And please give it a thumbs up on YouTube and share wherever YouTube videos are shared. Here’s the music video for “Two Cats.” It’s the first music video from Squirrelmageddon. I hope you vote it as being “funny” or at least “furry.” It stars my two cats, Benji and Crush including kitten footage from seven years ago when we all first met. They just had their seventh birthday and it was marked with catnip and a new cat tree. I used a Digitech Jamman Phrase Looper pedal to write this one and did all the parts with my voice. It’s a cappella and rap. I shot the video with a handheld Ikea light that I shook and shined in all of our faces. Download the mp3 for “Two Cats” and the entire Squirrelmageddon album at rhunekincaid.com/music and look forward to more music videos extremely soon! Please vote for ‘funny’ on FunnyOrDie and share that version it wherever you can! And please give it a thumbs up on YouTube and share that version wherever YouTube videos are shared. This page took 0.694 seconds of computer labor to produce.